Comparing Car Vacuum Cleaners – Which One Is Best? You also need to have the right attachments for getting dirt out of the tighter places inside your car. For the seats and embedded dirt in the carpet you will want a turbo tool with spinning brushes. This is necessary to agitate the ground in mud so it can be picked up by the suction power. Another important accessory is the crevice tool, perfect for reaching down into the backs of the seat cushions. Aside from the carpets the seats are where most of the mess ends up. Food particles, dirt, and pet hair all find their way on and inside your seats so you need to have an attachment that can reach them. Quality filtration is also important because you will stir up a lot of dust when vacuuming the inside of your vehicle. A HEPA filter will trap the dust mites as the air passes through the machine so it doesn’t end up back in your car. Constant suction power is also important for cleaning your entire vehicle. This can be a problem for handheld or cordless vacuums as some batteries will reduce their suction as the power goes down. When looking at cordless options you want to make sure the battery will keep the suction constant as it drains, resulting in enough time to get your whole car free from dirt. This can also be a problem with corded vacuum cleaners (especially bagless) if they are susceptible to clogging inside. Higher suction power and quality filters can greatly reduce the chances of this happening. The Shark Rotator Powered Lift-Away is our top rated full sized model for cleaning cars. For starters it only weighs approximately 15 lbs. which is quite light when compared to other large uprights. It is nimble and easy to steer via their Dynamic Power Steering but that isn’t the reason we like it so much for automobile cleaning. The main reason is the unique Lift-Away™ feature, which allows you to quickly remove the main body to have a fully powered and portable canister vacuum. And this cuts the weight down even more. The Rotator also comes with a variety of available attachments to make it easy to reach many places including inside your vehicle. Depending on which model you choose you will get (or have the option to add on) a pet upholstery tool, a mini motorized brush, a multi angle dusting brush, and various crevice tools. Shark also offers a flat under appliance attachment that would work great under the seats or deep inside the trunk. As for filters, the Rotator comes with a fully sealed HEPA filtration system that traps more than 99% of the smallest allergens. And since it is sealed no dust can escape out during use. This helps keep the air cleaner after use and also keeps the suction power constant, as there is little chance of clogging. For more information including online consumer reviews, click here to visit our recommended eCommerce site. The Dyson V6 Car and Boat is an excellent handheld choice for a variety of applications. 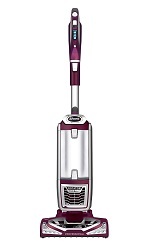 If you are strictly looking for something cordless then the V6 has to be at the top of your list. When you sit inside any modern automobile and look around you will notice that things really aren’t designed for ease of cleaning. They are usually designed to hold as much technology and comfort items as possible. So to truly get the interior clean you need to find a vacuum that is unlike traditional models. For starters, the V6 has an extension hose to reach way under the dash or seats. Most handhelds do not have this feature but are more of a fixed size, but this compact Dyson was designed with a “thinking outside of the box” mentality. It also comes with crevice, combination, and mini motorized tools to really get to embedded dirt that rests down in your carpets. The Car and Boat model is additionally outfitted with a mini stiff bristle brush and soft dusting brush for dashboards and other hard places that collect dust. Just over 20 minutes of steady power on a full charge can be expected with very little fading during use. That should give you ample time to clean the average sized auto or truck. Overall it’s the best handheld choice and this is quite evident when reading any number of online consumer reviews, which are overwhelmingly positive. Click here to check current pricing and compare models at our favorite supplier. 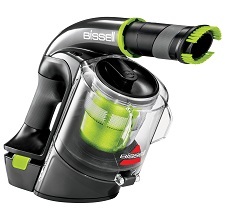 The Bissell Multi is another great handheld choice for anyone looking to quickly clean their car. 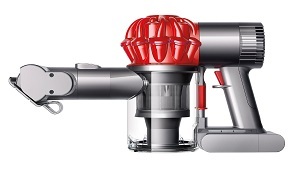 It is quite similar to the Dyson V6 but has a different design. The extension hose comes out of the top, and this is also where the attachments are connected. You also get a soft ergonomic handle which makes holding the machine in various positions much easier on the wrist. This is a nice thing to put into the design and really enhances the usability. 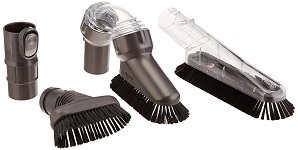 In addition to the extension hose you also get the usual attachments including a crevice tool, dusting brush with soft bristles, and a high performance motorized brush roll for loosening anything that is stuck to the carpeting. Dual LED lights also help illuminate the entire area so you can see what needs to be vacuumed up. Bissell really thought of everything when they built the Multi hand vac. The removable lithiom ion battery is ultra modern and lasts much longer than prior generations. The Multi is very lightweight and comes with everything you need to clean your car’s interior. It also has a lower pricetag than the Dyson, making it a great choice. It really comes down to your preferences when comparing the two. Performance is similar but the Dyson does come with a few more specialty attachments. This is the biggest difference between the two outside of cost. To read more about it and compare current pricing to other models, click here to visit one of the biggest online retailers.